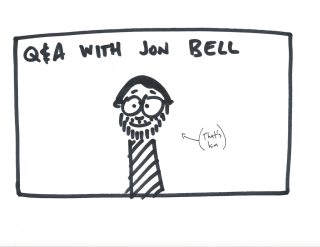 With the help of some handy diagrams, Jon Bell explains what life is like at Twitter and introduces his unique approach to presentations. Jon Bell will speak at Generate San Francisco on 9 June, alongside Aaron Gustafson, Stephanie Rewis, Rachel Nabors, Steve Souders, Josh Brewer and eight other great speakers. Get your ticket today! Please introduce yourself. What do you do? I'm a product designer that loves to write and teach. I've worked on lots of products from Real Player back in 2000 to consulting at Frog Design to startups to Windows Phone to my current job at Twitter. On the side, I founded a company that teaches design called UX Launchpad. What's life like working at Twitter? The other day I was DMing with someone in a war zone about some Twitter feature ideas that would help them to survive. That's how life is: humbling and complicated. Everyone has ideas about what Twitter should do, and only a small group of people actually get to design and ship them. That's always on my mind. I’ve been doing this work professionally for 17 years, and over 20 if you count freelance web work in the mid-90s. I’ve found the most joy in 'leaning out'. It freaks people out sometimes. You come onto a team and expect the senior designer to take the hardest stuff and the junior people to have smaller tasks. But I like to flip it. Give the new people the biggest challenges, then be there for discussion. Trust them and they’ll grow faster. Other than lots and lots of listening, I spend a lot of time helping people craft stories and writing what I call 'design rationale' documents. I like to write design specs like I’m a journalist or a historian. My thinking is: don’t just explain what you did, explain every single tradeoff. Explain why. This is where Design Explosions came from. Do you still do Design Explosions? Yup! It’s like an indie band you used to love who’s taking a suspiciously long hiatus. Then after you give up on them they suddenly release one more album. You buy it out of nostalgia and think, 'Hm, maybe they should have just stopped at the hiatus'. But I'm not that smart. What are your top three tools that you use in your day-to-day work? You work at Twitter but have very little online presence, even on Twitter. Please explain. That didn’t clarify anything, did it? Darn it. Among other things UX Launchpad teaches UX design to non-designers. How do you do that? What's the single most important thing engineers and dev would need to get their head around? My co-founder William Van Hecke and I both feel very strongly that design is just problem solving. We spend all day demystifying design to make it as fun and hands-on as possible. I modelled the class on Penn & Teller. Like them, we don’t have a lot of patience for making our field an ivory tower that only some people can access. It’s way more accessible and fun than it seems when you’re talking to some arrogant jerk at a networking event about how great he is. When engineers or product managers leave our class, they’ll often say they haven’t had that much fun with building and creating since they were much younger. Mission accomplished! If you’re not playing, you’re doing it wrong. What’s the Design Play Manifesto? So the manifesto (currently in draft form) is me trying to spread the thinking a bit in an open source way. A couple of Design Play meetups have happened around the world since then, which is so cool. The description for your Generate San Francisco session is unusual. What can people expect to take away from the talk? I purposely keep it vague because it’s a unique talk format, but for the curious I have an article I wrote about it here. And for the slightly less curious I have this marketing department-approved PR image. Share with all your friends, especially the target demographics my company is currently geo and topic targeting for maximum shareholder value. Am I doing this right? What irritates you most about product design and how could we avoid those mistakes? I won’t answer here for fear of being blacklisted from the design community. But I’m writing a series of essays called Unpopular Opinions About Design, so if anyone is reading this, I’d love to chat with you about it at the conference! I’m a hoot in person. Don’t be shy. What’s your advice to anyone aspiring to work at a big tech company? See previous answer. I can talk about this for hours. Literally. Like, when I get going, a crowd sometimes forms because it's so out of place seeing someone talk so frankly and excessively. Come be a part of the freak show! What are the three biggest lessons you’ve learned in your career? Jon Bell will give a presentation at Generate San Francisco alongside 13 other great speakers from the likes of Netflix, NASA, Uber, Salesforce and more. Topics covered include adaptive interfaces, web animations, design and performance, prototyping, design systems... and astronaut autonomy through design. Get your ticket today!